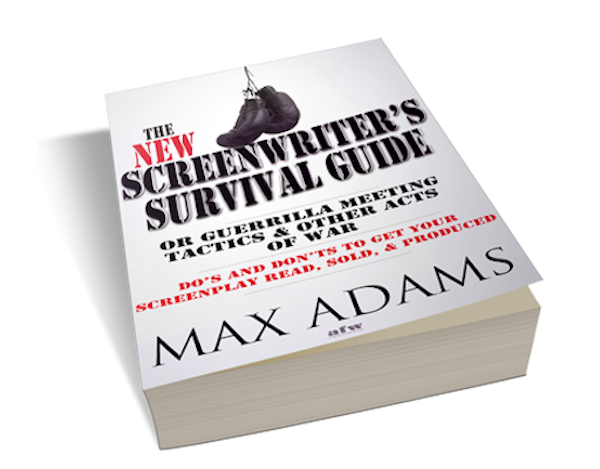 THE NEW SCREENWRITER’S SURVIVAL GUIDE: No one had ever won the world’s two hottest amateur screenwriting awards – The Nicholl Fellowship from the Academy of Motion Pictures Arts and Sciences and the Austin Film Festival screenwriting award – in a single week. No one else had ever sold three pitches back to back over the Christmas weekend. And almost no one else had ever made her first sale as a complete unknown from outside California – and gone on to get it produced starring the then hottest young actress in Hollywood. People just don’t do that. But Max Adams did. From guerrilla meeting tactics to finding (and firing) your agent, from maintaining “voice” to pitching and getting paid, the screenwriter crowned “Red Hot Adams” by Variety who has been there, done that, and lived to talk about it tells you how to get read, sold, and produced. And, more importantly, stay alive and successful for a long time afterward.